Kim Cavanaugh, RVT | Full Circle Vet Alt. Kim is no stranger to us, we were thrilled to finally join forces with her in our transition in 2017. In addition to being a highly knowledgeable RVT, she is also a certified canine rehab technician (CCRT) and provides all of our rehabilitation patients with excellent ongoing care, this includes everything from post-operative TPLO care to aiding older animals with their mobility, through a variety of modalities, including massage, laser therapy, muscle conditioning exercises and hydrotherapy. “From as young as I can remember, I had been bringing home animals to save. It just seemed natural to go into the industry. The agricultural college was my home for 3 yrs back in the early 1990’s. I have been a registered full-time tech for 22 yrs now. 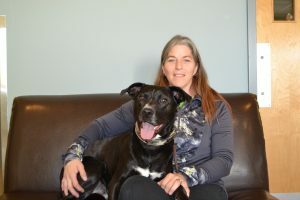 In addition to her work with rehabilitation, in her spare time, Kim also revels in canine training and behaviour with her Certified Therapy dog, TeeJay and her other dogs Higynx and senior love, Wally.